Researchers now say that the stress of not being able to process information as fast as it arrives – combined with the personal and social expectation that, say, you will answer every email – can deplete and demoralise you. Still, a survey of 2,300 Intel employees revealed that people judge nearly one third of the messages they receive to be unnecessary. The reason for this is simply the fact that it is far too easy to ‘publish’ information now. Previously, if you wanted to communicate with someone you had to find a pen and paper, sit down, think about what you wanted to say, write down your thoughts, put them in an envelope, address the envelope, pay for a stamp and then mail the letter. Now people can readily blast off volumes of email with the click of a button. The emphasis has shifted from composition and creation to reading or consumption. The problem with this shift is simply that the not only has the cost of publishing decreased but also too has the quality. Look at the number of irrelevant, poorly formatted, grammatically incorrect emails you receive. What does that tell you about the sender? What sub conscious message does it convey when you read a sloppy email? At the end of the day, it’s about your image, typing mistakes and poor grammar are the same as walking into a room looking unshowered and dishevelled. Good emails show you have both professionalism and class. For starters ask yourself what impression you form of a sender when you receive a “badly formatted” email? Now ask yourself whether you are in fact committing the same offence. And don’t forget that emails always end up being archived somewhere so your “bad” email can come back to haunt you in the future. A study by Microsoft found that once their work had been interrupted by an email notification, people took, on average, 24 minutes to return to the suspended task. Think about this. How much work could you expect to get done in a day if you receive and interruption every 5 minutes or so and it takes you 24 minutes to return to the original task? based on these numbers you have to say that it certainly doesn’t appear much of anything is getting done does it? How has all this happened? Simple. We have allowed the technology to dictate to us. We have created a monster and allowed to escape and ruin our lives. Wasn’t technology suppose to free us from stress? Wasn’t it supposed to give us more time? Wasn’t it suppose to allow us to get more done? By simply accepting the defaults that come with technology we are doomed to become its slave in a struggle we can never win. Yet there is hope but it comes at a price that is usually too high for most people. Eliminate the distractions, only read and respond to emails at certain times because do you get paid to process emails? Generally, most people get paid to work and as this article demonstrates there doesn’t appear to be a whole lot of that going on! So turn off the emails, put the gadgets to one side and learn to live your life in control not dominated by entities that are constantly running low on power. Chances are it’ll lower your stress levels and you’ll actually start getting stuff done. or visit my Slideshare (http://www.slideshare.net/directorcia) for a number of other articles on productivity improvement. I think most people have heard of the saying “if you can’t measure it, then you can’t manage it” and yet many people seem to be failing to even do basic measurements. Give the plethora of free measurement tools that are available on the Internet these days (Google Analytics is probably the best example), there really isn’t any excuses. What prompted me to write this post was a blog post from Seth Godin called “Everyone gets paid on commission”. It details how a writer got laid off from the Washington Post because his blog posts where no generating enough traffic. It illustrates how in today’s world you can very quickly determine how many people are reading or looking at the stuff you have on the Internet. As Seth concludes, “in a digital world where everything can be measured, we all work on commission”. It again illustrates that fact that we are living in a very different world from the one that many people believe they inhabit. Personally, I spend a regular amount of time each week recording a number of key metrics around my business online. Such monitoring has highlighted issues that I am working to address. It has garnered results from tests that I have performed so I know what does and doesn’t work online. I have really come to appreciate in the last year or so how important metrics are to a business and why if you are not performing metrics you are simply fooling yourself. It may take some time to determine what key metrics you need to track but the more you invest in determining, tracking and reacting to these the more profitable your success will become. I am always on the look out for more quality information sources as well as tools to provide metrics on how my business perform. If you know of any that work well for you please let me know via director@ciaops.com. In an earlier post I mentioned how Microsoft had released its Office Web Apps for limited preview. And in another post I also mentioned how you need to be constantly improving you information sources as simply relying on technical experience no longer cuts it these days. Why do I mention these two posts? Well, I was browsing through my regular information sources when I came across a way to get onto the Office Web Apps preview program. Now this information didn’t come from Microsoft but I can tell you that I managed to get onto the program as you can see from the screen shot below. 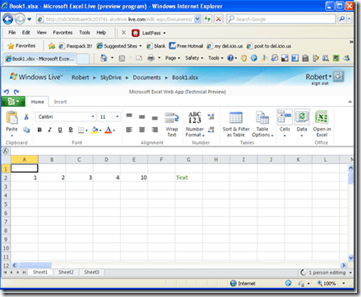 Here’s Excel running in a browser window. What I can say after some initial fiddling with Office Web Apps is that it only has very limited functionality but that is to be expected in a technical preview, but what I have seen so far is impressive. It is really just like Excel. Doing all the basics is the same, adding cells, creating formulas, customizing text, etc. As you can also see from the above screen shot, you also have a couple of options to download the files you create to your local machine, otherwise it remains in Skydrive. Nice. From this screen shot you can see that under the Office Live Apps preview I have the ability to create (and use) Excel, PowerPoint, Word and OneNote all on the web. Now that I’m in the program I’ll be interested to see how it pans out and what features start to work their through. I’ll also be interested to compare what the Office Web Apps version has compared to the desktop version of Office 2010, which I’m also running. Now all I need is a beta copy of SharePoint 2010 to play with and I’ll be in heaven. Anyone know how to get onto that beta? I’m on a number of technical email lists. These lists allow people like myself to post technical questions that get read by a whole group of other technical people. The hope is that someone on the list knows the answer or has some experience they can share to help the person making the initial request. It was the sort of thing done before all the Web 2.0 stuff came along, and yes, it is really ‘old world’ stuff but for the technical people who use these lists they are yet to come into the 21st century. As I have said many times, just because you work with technology don’t assume you understand technology. Nothing could be truer than in this case. That issue, however, is not the focus of this post, it is instead around how Google is having a major impact on technical professions. What recently used to happen on these technical email lists was that someone would post a question and someone else would tell them to use Google before they posted the question. Fair enough in my book. Now I see questions typically start with ‘I have a problem that I can’t solve using Google’. Recently one such question resulted in a reply from another member of the forum that they found the answer on Google as the top result in their search request so why could the original person find it on Google? This exchange raises some very interesting issues. Firstly, with the vast array of information available on the Internet, in-depth technical information on just about every product and technology is available for free. How can you therefore compete on a technical ability any more? Google allows someone with much less knowledge and experience than you the ability to find a solution in potentially less time than you ever could. So, you may have spent years building up your technology knowledge but guess what? Google has just about made the playing field equal for all players no matter what their technical skill or experience level. Secondly, no longer is it your technical ability that will distinguish you, it is your ability to find relevant information faster than your competition. However, I ask whether many people actually spend time improving their informational sources? Likewise, I ask whether many people actually spend time improving their searching skills? I know for a fact that most people do neither! Most people don’t know that Google has advanced search options. Most people don’t know that Google allows the use of operators (+, –, AND, OR, etc) in searches. This means when they use Google they get millions of results rather than thousands. Give that order of magnitude difference with results returned how effective do you think learning more about improving your skills with Google is going to pay off? Seems like simply math to me but nobody seems to do it. So don’t be fooled into believing that all that technical knowledge you have accrued over the years is going to put you in good stead. Your most likely younger and smarter competition are investing their time in improving their informational sources as well as improving their ability to search these sources. Honestly, as the power of search technology improves and the amount of information available on the Internet increases, your ability to compete technically doesn’t stand a chance. So spend time improving your searching skills grasshopper and become a true Google ninja. <img src="http://lh4.ggpht.com/-8k5KoHV_aFg/UQhbnhlZ3jI/AAAAAAAAIGE/zM41DoMoX3s/video20a8196c5b11%25255B5%25255D.jpg?imgmax=800" style="border-style: none" galleryimg="no" onload="var downlevelDiv = document.getElementById('03cc49ad-7d59-4ada-8c1f-7ebdffe71801'); downlevelDiv.innerHTML = "
If you are someone who makes a living selling PC’s then the most common application you sell with every PC is probably a version of Microsoft Office. If you’re a smart cookie then you’ll also make money from installing the software as well as continually patching it. I hate to tell you that the majority of all this is going away when Office Web Apps goes live. Why? Simply because most users are not only stingy with their money (especially at the moment) but they also generally use less than 20% of Microsoft Office functionality. This means that a free online version of their favourite Microsoft Office apps is going to be very appealing. In short, why would they buy a version of Microsoft Office with their workstation when they can get for free online? I think that if Microsoft provided a ‘paid for’ version of Office Web Apps that included more functionality people would pay but as I have said for quite a while now this is the way it is going – to the ‘cloud’. I agree that everyone isn’t going to go ‘virtual’ overnight but the trend is very evident and more importantly the business and economic reasons are also very powerful. As the economy recovers and businesses get back on their feet they are going to look at upgrading their technology. I reckon that many are going to start asking serious questions about whether they should be utilizing more applications from the ‘cloud’. To a large extent by Microsoft moving applications like Office to the ‘cloud’ provides a significant amount of legitimacy in the minds users for this style of technology, making it a self fulfilling prophecy in some ways. Failing to ignore these trends is going to have ramifications down the line no matter what sort of business you are. The great things about Microsoft apps moving to the ‘cloud’ is that they still provide the ability to host the same applications on site if desired (unlike Google). It also allows the implementation of hybrid approach as well (i.e. some offsite and some onsite). Office Web Apps has now gone into limited beta testing and is expected to open up to more soon. Personally, I can’t wait to get my teeth into it because I can see the huge potential it offers around the thing that has always been the most profitable part of technology – assisting users with their implementation. If you are a reseller who doesn’t believe in the potential of ‘cloud’ apps like Office Web Apps I say GREAT because sooner or later customers are going to come looking for someone to help them implement a ‘cloud strategy’ and I’m ready willing and able. Here’s a handy resource for people getting up to speed with SharePoint. It’s a SharePoint Quick Reference Card which is available from the Custom Guide site. You’ll also find a whole swag of other free Quick Reference guides on just about every Microsoft Office product out there also at the Custom Guide site. Even if you don’t need them yourself I bet you know someone who does! I have just completed the free SharePoint webinar – ‘An Introduction to SharePoint on SBS 2008’ which I have uploaded to YouTube in three parts, which are linked below. <img src="http://lh5.ggpht.com/-XM5dGKfBa-I/UQhWYfebzrI/AAAAAAAAIFs/BuAzt–E-qc/video977de9377224%25255B10%25255D.jpg?imgmax=800" style="border-style: none" galleryimg="no" onload="var downlevelDiv = document.getElementById('7ec6195e-78ab-4bf7-91e0-b0bea44f8181'); downlevelDiv.innerHTML = "
<img src="http://lh5.ggpht.com/-n7fUf8mq614/UQhWZVnbsrI/AAAAAAAAIF0/1GDGdvvgEV0/videoc789cc74463c%25255B8%25255D.jpg?imgmax=800" style="border-style: none" galleryimg="no" onload="var downlevelDiv = document.getElementById('876d8c30-17e0-4230-8080-f25044f3ebe1'); downlevelDiv.innerHTML = "
<img src="http://lh4.ggpht.com/-xahe9MtanJQ/UQhWafDye4I/AAAAAAAAIF8/ztO6U5Cly5Q/video119c557151fd%25255B5%25255D.jpg?imgmax=800" style="border-style: none" galleryimg="no" onload="var downlevelDiv = document.getElementById('4749d7b7-b884-4217-b532-0261cc29a85d'); downlevelDiv.innerHTML = "
Alternatively, you can download the whole 30 minute presentation in WAV format from my SkyDrive. I’m now working on a webinar schedule from November 2009. My aim to is do a webinar every 2 to 3 weeks. These webinars will be available in both free and paid versions, with the paid versions running longer and going into much greater depth. However, I will continue to also do as many free webinars as I can. Hopefully, all the webinars will also be available for download as well after the fact making them a good source of information. So I’m currently developing a schedule of upcoming webinars that I’ll be publishing soon. If you have suggestions of what you’d like to see, drop me a line (director@ciaops.com). If you’d like to stay up to date with webinar schedule as it becomes available simply keep reading this blog or send me an email (director@ciaops.com) and I’ll add you to the mailing list. As always, I welcome any feedback you may have on what I have created and keep you eyes posted for information on the upcoming webinar schedule. Microsoft and Telstra have finally made the Microsoft Business Productivity Suite (BPOS) available in Australia. 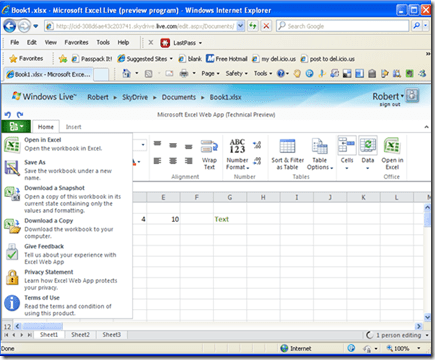 This means that people can now obtain Microsoft Exchange, SharePoint, Live Meeting and Office Communicator as hosted applications. It also means that providers like myself can sell the suite to customers and earn some commission. Gotta say this has been a long time coming but I can’t tell you how glad I am that it has finally arrived. I see BPOS as being the early days of the way things are now heading. Most encouraging is that it allows me to sell solutions to customers without the constraints of geography anymore. In a few recent presentations I’ve given I’ve told other resellers they should be afraid of something like BPOS because it means that I’m coming to their market and their customers. I say this with the full knowledge that exactly the same is possible in my market space because this is what the new world order of cloud computing brings. It means a completely new business model. It means you face a greater number of competitors but it also provides you with greater opportunities to reach new markets as well. The only question is whether you will exploit the opportunities presented or simply react when the competition arrives on your shores. As I have said before I believe the killer app for BPOS will be Live Meeting, simply because it is something that is going to provide real benefits for most customers who have never had access to technology like this. They will be able to conduct remote meetings, present sales demonstrations and importantly record them for repeat use. How powerful is that going to be to a business to provide a video presentation of their products and allow people to view it on demand? Of course the other huge potential I see is for SharePoint, given that so few people are aware of the benefits it can provide. Another great opportunity will be the ability of SharePoint to provide templated solutions, that can be developed and then resold many times over. Combine that with something like OneNote and you have a really great collaboration solution as the Pfizer case study demonstrates. Perhaps another benefit that BPOS provides resellers is environment standardization. 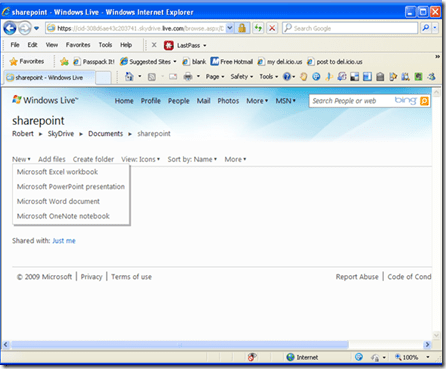 This means that every BPOS implementation of SharePoint say is identical. Everything is always in the same place, the software is always at the same version and so on. How many times is this the case between different client sites? Almost never. Having a completely standard environment not only makes it much easier to support but means that I can develop standards and procedures that allow others to easily implement the administration while I can concentrate on the higher return work. As I have detailed in a previous blog post I am always encouraged when other resellers ignore or are hostile to SharePoint because it simply means more opportunity for my business. It provides me an opening with their clients that I can now exploit no matter where they are in the world. In the end I see BPOS not only providing greater opportunities but also simplifying the ability to deploy and support solutions for customers. Isn’t that what we’re all really after?